Lightning over NASA Kennedy Space Center's Launch Pad 39A competes with the xenon lights on the pad illuminating space shuttle Discovery waiting for a scheduled liftoff on the STS-128 mission on Aug. 25, 2009. Launch was scrubbed due to the weather conditions that violated the limitations for liftoff. Thisstory was updated at 2:00 a.m. EDT. CAPECANAVERAL, Fla. - Lightning and thunderstorms thwarted NASA?s attempt to launchthe space shuttle Discovery early Tuesday, forcing its seven-astronaut crew towait at least one more day before leaving the planet. Discoverywas slated to blast off from a seaside launch pad here at NASA?s Kennedy SpaceCenter at 1:36 a.m. EDT (0536 GMT) Tuesday with forecasts predicting an 80percent chance of goodlaunch weather. But that near pristine forecast crumbled away late Mondayas lightning, rain showers and thick clouds unexpectedly cropped up to preventthe launch. Lightningstruck near the launch pad several times, at times within 5 miles (8 km), whileDiscovery?sseven astronauts were strapped into their seats hoping for liftoff. Cameraviews showed rain pouring down on the launch pad during the countdown. Theweather did improve closer to launch time, but it was not enough to clearDiscovery for liftoff, mission managers said. ?Thevehicle and operations were cooperating, but unfortunately the local weatherdid not,? NASA launch director Pete Nickolenko told Discovery?s crew. ?We?llhave to scrub for today and just try again tomorrow.? ?We copy,?Discovery?s commander Rick Sturckow radioed back. ?As soon as the weather willbe ready to cooperate, we?ll be ready to go.? Discoveryis now slated to launch no earlier than Wednesday at 1:10 a.m. EDT (0510 GMT). The chiefweather concerns for Discovery?s launch attempt Tuesday were rain and thickclouds near the launch pad, as well as lightning and thunderstorms too close toa nearby runway that is reserved in case the shuttle suffers an emergencyduring liftoff, said Lt. Col. Patrick Barrett of the Air Force?s 45th WeatherSquadron. Barretttold SPACE.com that there is a 70 percent chance of good weather for Discovery?snext launch opportunity on Wednesday. 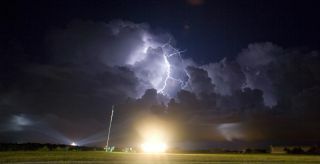 Stormyweather, and lightning in particular, has been a thorn in NASA?s side forshuttle launches of late. The July launch of shuttle Endeavour was delayedfive times due to lightning and foul weather. Lightning also slowedDiscovery?s trek to the launch pad earlier this month. NASA hasuntil Aug. 30 to launch the shuttle before standing down due to restrictions onthe launch range it shares with the nearby Cape Canaveral Air Force Station.NASA wants to launch Discovery by the end of August to avoid a traffic conflictwith an unmanned Japanese cargo ship also due at the space station this month.If the mission is unable to launch by then, NASA can try again on Oct. 17. Discovery?smission is slated to fly to the International Space Station to delivernearly 8 tons of cargo, including new science gear and a treadmill named after comedianStephen Colbert. The 13-day mission will also ferry astronautNicole Stott to the station to replace NASA astronaut Tim Kopra, who has livedaboard the orbiting lab since mid-July. Set tolaunch aboard Discovery with Sturckow and Stott are STS-128 missionspecialists Patrick Forrester, Jose Hernandez, Danny Olivas and Swedishastronaut Christer Fuglesang. Fuglesang represents the European Space Agency,while the rest are NASA astronauts. Three spacewalks were planned for theirmission. Stott isset to begin a three-month mission to the space station as a flight engineer onthe outpost?s six-person Expedition 20 crew. She will join two Russians,another American and astronauts from Belgium and Canada on what is thestation?s first full-sized crew. IfDiscovery is unable to launch Wednesday, the next opportunity is Thursday at12:52 a.m. EDT (0452 GMT). SPACE.comis providing complete coverage of Discovery's STS-128 mission to the InternationalSpace Station with Managing Editor Tariq Malik in Cape Canaveral, Fla. Click here for shuttle missionupdates and a link to NASA TV.